So as most people are thinking about what to pack for summer holiday and how many carbs shouldn’t be consumed, at Cakes by Robin we turn to thoughts of Christmas. 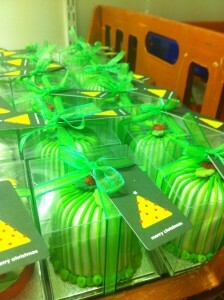 It’s a busy time for us and we get a lot of corporate cakes ordered as gifts for their best clients or staff parties. These ones pictured below are part of an order for 250 miniature Christmas cakes that we made for a company called Keenpac who make all the high end packaging for people like Molton Brown, Prada, Miller Harris and lots of other luxurious brands. They wanted to send out a gift to each of their customers that was Christmasy but was very obviously from them. In order to achieve this we used their company logo as the theme to run through the 3 designs of miniature Christmas cake which was handily shaped like a Christmas tree. 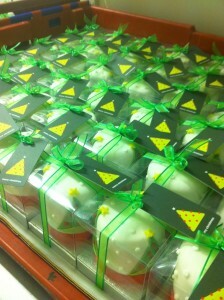 They wanted to create their own labels and so we added these on with the ribbon and the finished boxes looked amazing.